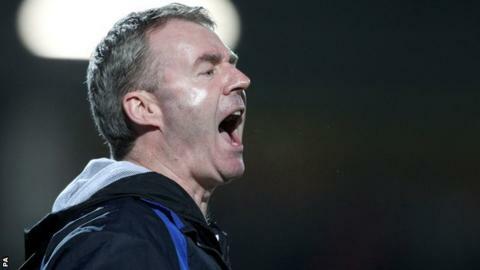 Plymouth Argyle boss John Sheridan says his side must start scoring goals if they are to avoid relegation from the Football League. The Pilgrims to drop to bottom place in League Two for the first time this season. "The problem with us is we're not scoring goals," he told BBC Devon. "We're defending as a unit and we're defending well and working hard for each other, but we're not scoring goals. "If we're not scoring goals we're not going to win anything." Argyle face two massive games in their fight to avoid relegation this week, as they meet fellow strugglers AFC Wimbledon and Barnet. "Results have gone against us and we find ourselves at the bottom now," Sheridan added. "We're in a scrap, but we have to be realistic. We've got to look at how we're going to create more chances and score goals to win games. "It's something we've got to look at, get it done and get it right quickly."